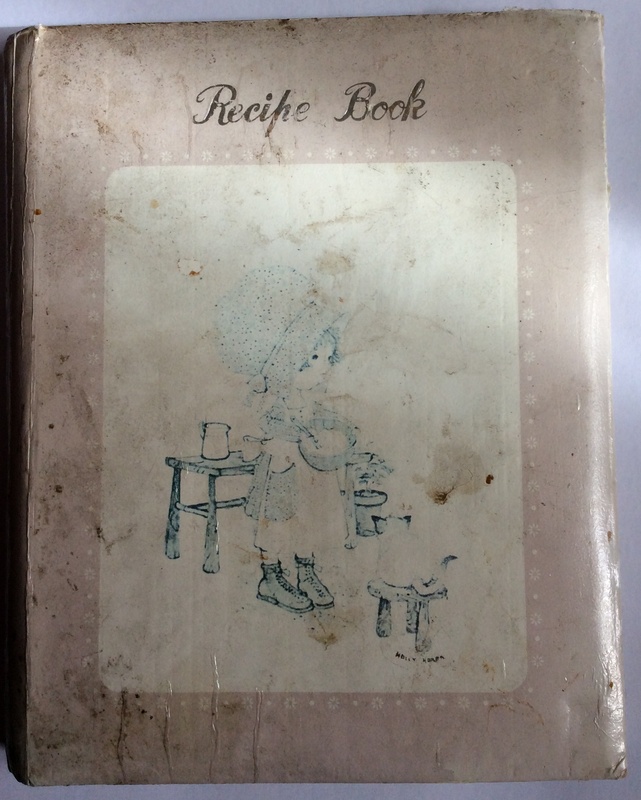 I have in my possession a recipe book from my childhood. Looking at it now, it is a gorgeous and glorious gourmet scrapbook for my stomach. It is woefully worn, some what battered, spattered with food and stuffed full of / suffused with, love. It is a simple thing and yet it signifies so much, this little book – and I am writing this latest love letter so I can wallow in unashamed nostalgia, see the seeds of my childhood growing into quirks and sense memories, and not least to search for any metaphors and messages for the me that is planted in the here and now, in this moment of foodie reflection. Before the book there was food. Plain and basic. Cooked up by my mother to feed us by rote and routine. My parents had lived through the Second World War and created their own simple menu of post ration availability and nourishment. My mother told me that her own mother was a plain and simple cook. My father only liked plain and simple food. My elder brother ate up whatever was on the plate. But not me. Never me. I was the “fussy” one. My palate did not like plain and it would change its’ childish tendencies frequently. To be fair to my mother – if I told her I liked something, she would serve it up again, and again and yet again. And then my taste buds would be bored to the point of nausea. The fussy one. It wasn’t easy for my mother in that sense; but then I wasn’t really allowed to be fussy. If it was on the plate I had to eat it, for I had a strict post war upbringing and no nonsense was ever brooked. But my taste buds and sense of self would not accept that, even if I was sent angrily to bed with an empty stomach and no baby boomer pudding. It wasn’t until I was in my 30s that I could actually leave food on a plate at the end of a meal, when one fine day I realised the roots of my needy greed to leave a clean plate behind, as tangible evidence of a meal consumed. So to the Recipe book… Sometime around the age of 10, my taste buds decided that plain and repetitive could not be constantly repeated – I had to take my stomach into my own hands. Given my mother’s draconian tendencies and the threat of verbal and quite possible physical violence if I decried the relentless menu, I came up with a plan. Looking back on it now, I can see that this sort of thinking has shaped my life so much – and how I believe that we are all creatures of both nature and nurture. I used my creative tendencies and innate mental intelligence to manage my mother, who I understood from experience could be persuaded by certain means – using my knowledge of her and my own brand of emotional intelligence. I love good food – with a wide variety of tastes and influences. There are times when baked beans are manna and there are times when only fine dining will do. It is a combination both of being born that way, and a reaction to the plain food that I grew up on. It was like divine timing. The very next time we were shopping in town, I came across this self-same (now battered, then pristine) book, nestled in its’ own orange box. Looking at it now, it seems like the product of a much more innocent era. The picture on the cover is of Holly Hobbie – a little girl, dressed in a patchwork dress and bonnet, who appeared often with a cute kitten in tow or doing sweet domestic things, like cooking… It was the current craze for little girls on both sides of the Atlantic at the time, with posters, dolls and other merchandise and so I had bought the brand, and also the opportunity to commit to my new food journey, now to be contained in its own, tasty journal. 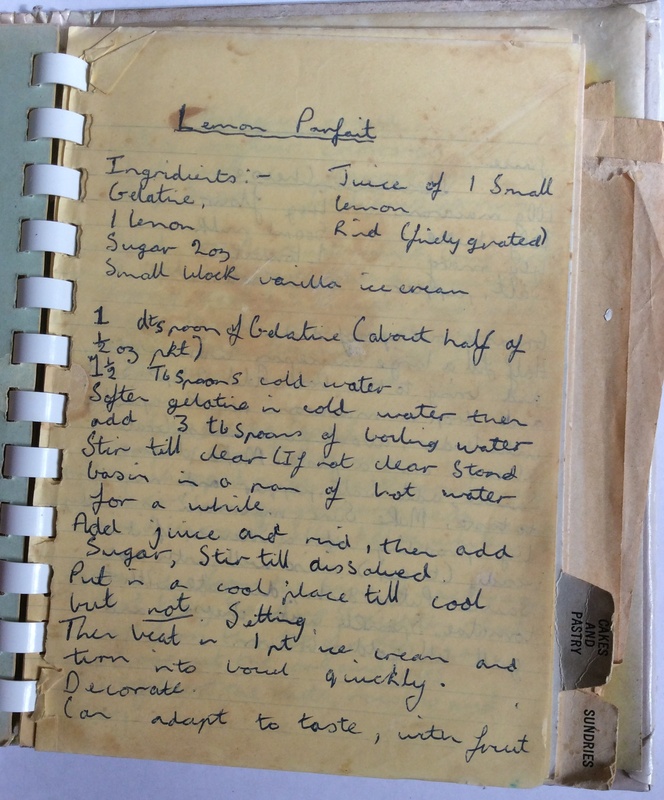 As I was learning at home, I was also learning at school and so I started to capture my favourite recipes along the way in the book. 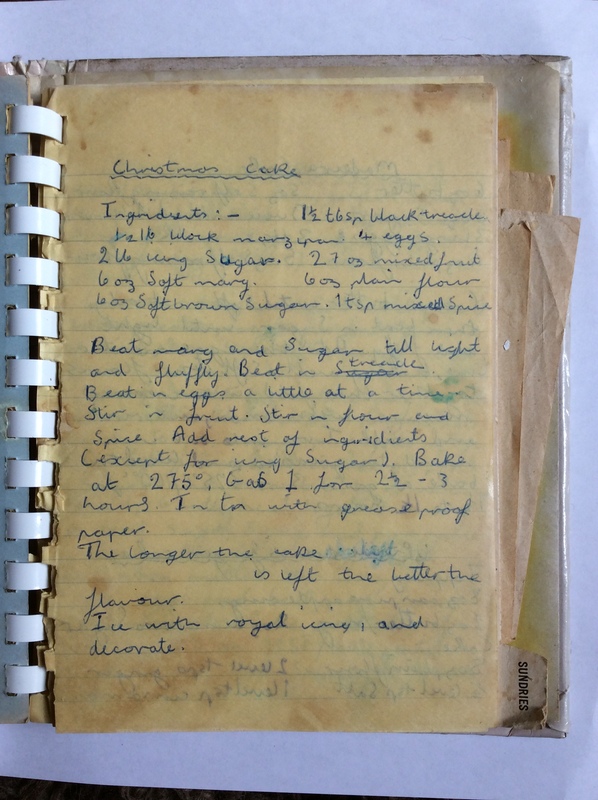 Christmas Cake was one such – I made my first one at secondary school in the Home Economics class and for many more for years after, taking and twisting the listed ingredients with my own ideas and spins and turns. I was also precociously pretentious and when it came to examination time, decided that by giving all my dishes a chef-fy French name, I would earn extra kudos and test points. Who knows, maybe it did, but whatever the result, still it was for me, an education both in food and in French, as I joined the dots of my learning life. 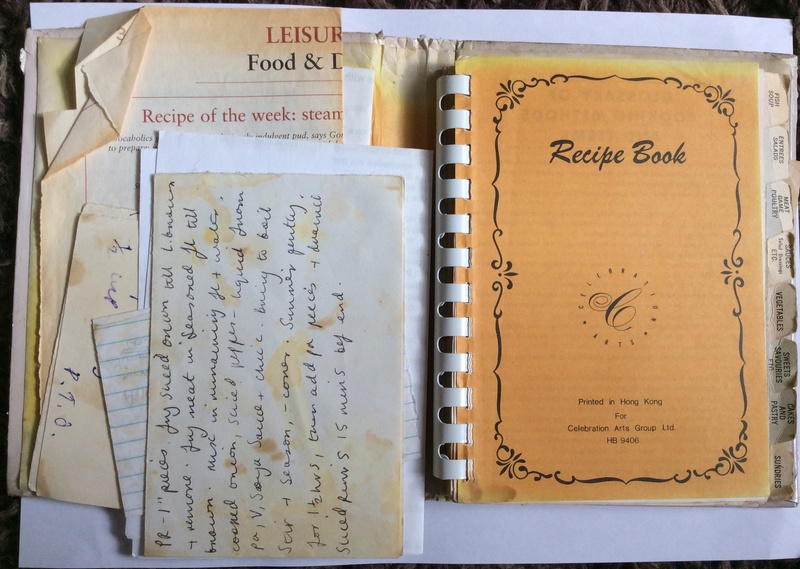 Later recipes reveal the summers I spent in the kitchen of the UK headquarters of what was then known as Moral Re-Armament (now Initiatives of Change), an ideological movement founded in America. My parents had been involved in it and from the age of 13 I volunteered to work in the kitchen of Tirley Garth – a stately home in Cheshire, helping to cater for upwards of 50 to a 100 people. They were happy times for me, living in the grand house, with the run of the most amazing gardens, covering many beautiful acres and meeting people from all over the world. People of all ages, all with the united purpose of being committed to the transformation of society through changes in both human motives and behaviour, all starting with their own. I would attend meetings, sing, cook and chatter all through my summers and as a result my food love grew more international. I ate and cooked exotic new delicious dishes, including this constant dessert favourite of mine – Lemon Parfait.